I think she was doing a Heil Hitler salute to someone in the balcony... possibly the Jewish concentration camp survivor. This would be considered legitimate news by the likes of wapo and nyt, if only aoc we're a Republican. That's straight out of a recent UN deal that many countries are actually signing on to that thankfully the US is not. Apparently lefties like aoc think the US should get on board with that. Scary stuff. I'll give her an ounce of credit for actually voicing that she's really for open borders. There's a ton of people talking about the immigration issue who simply want open borders, but don't say it. Our daughter, for instance (22 now), honestly doesn't even get why any borders exist. Interestingly, her office has now taken down their page describing the GND. Maybe some of the grammatical errors embarassed them more than some of the ideas, who knows? Or maybe the figured out she is looney tunes and will NEVER get re-elected with that plan and they took it down for her. She's safe in her district. It's what damage she'll do to the Dems in general that is the problem for them. The "old guard" is going to have to deal with her. Watch the 2 videos here of her rambling on to a committee. The first one is on Occupy Democrats & numerous other sites with James Corden & others falling all over themselves to say he she really schooled the guys on the committee. Then watch the 2nd one. It's the part that's cut out of the first video & it's priceless. One of the committee members calmly takes about one minute to tell her she's wrong on pretty much everything she's spent five minutes on. You can bet your boots that there's plenty of animosity within her own party right now & there's not a microphone or camera she doesn't love. Her increased exposure is gonna bite her eventually. Except that her own party is looking for someone that is more mainstream and actually has working brain cells to run against her in the primary. She has a degree in Economics from Boston University. I wonder when Boston University started hiring 4th graders as Economics professors? Running this through the old Babelfish: "We floated the GND, the world laughed, and we pulled it down as fast as we could and now we're spinning it." 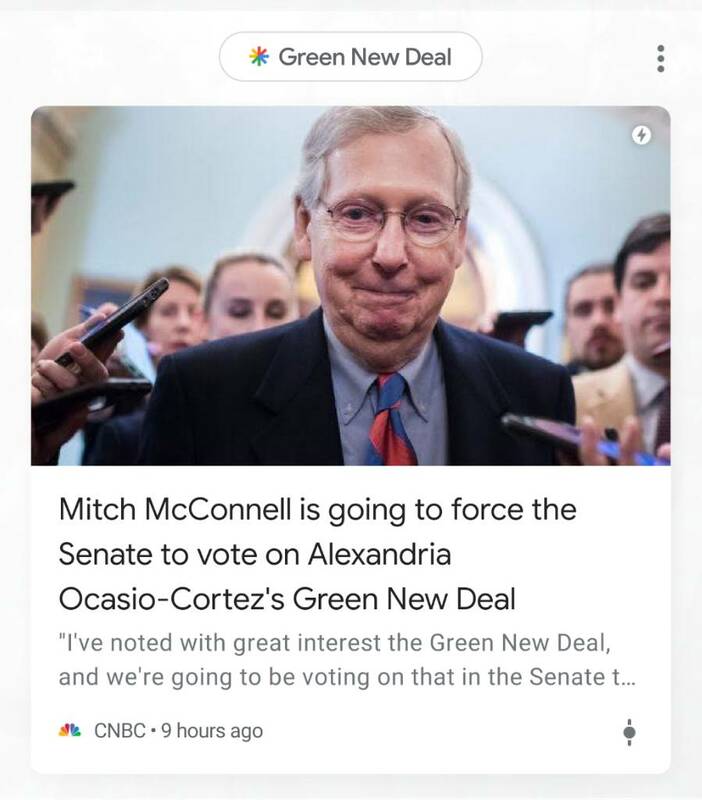 McConnell to bring up the Green Deal in the Senate and force several Dim presidential candidates to vote. Screen grab of my Google feed. Perfect facial expression for this one. Lol. Markey is already setting himself up to vote No, but blaming CocaineMitch for "sabotage" - for bringing it to a vote. You can't make this stuff up.